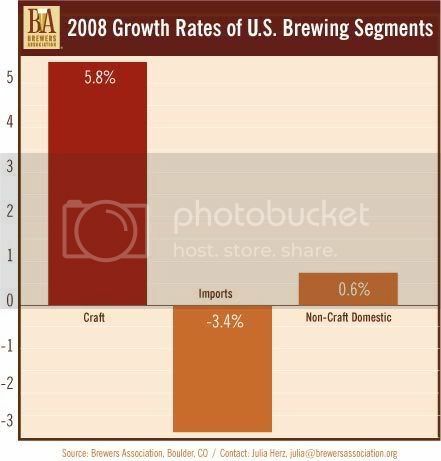 This week, the Brewers Association released their 2008 American beer industry growth figures. There's lots of good news for American craft brewers to be found, as their segment grew 5.8% by volume (and 10.5% by dollars) during last year. Craft brewed beer now accounts for 4% by volume (and 6.3% by dollars) of the overall American beer market. While the craft segment didn't grow as rapidly as it did last year when it expanded by 12% by volume, there was still steady improvement. As for the rest of the American beer market, things weren't quite so encouraging. The import segment shrunk 3.4% by volume, while the "non-craft domestic" segment grew at a rate of just 0.6% by volume. Obviously, the big loser here is the import segment. Perhaps with the economy in the state it's in people are feeling a bit more patriotic? 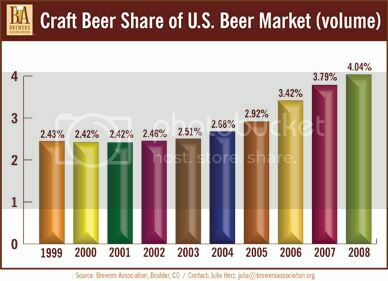 2008 was a historic year for beer with the large brewers consolidating and imports losing share, while the top ten selling beer brands dropped in sales. At the same time, small independent craft brewers continued to gain share and attention. So is beer, specifically good beer, truly recession-proof? It's probably too early to tell just looking at the 2008 numbers. I think that when these numbers are released again next year, we'll have a much clearer answer. Here's hoping it is. Check out the whole report to draw your own conclusions.